For those who prefer to keep their feet on the ground the Bahamas offers some excellent bird-watching opportunities. Many islands shelter fairly wild interior reserves where visitors can find hundreds of different species among the palms. 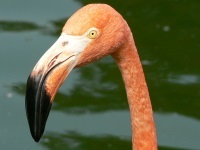 Great Inagua Reserve is best for more varied bird watching, and at Inagua National Park visitors might glimpse the world's largest flock of West Indian flamingo. Other exciting bird-watching spots include Abaco National Park; Man-O-War Cay; the area around Love Hill, on the northeastern coast of North Andros; and Armbrister Creek, just north of New Bight on Cat Island. Migrating birds come to the Bahamas mainly in the autumn and the winter (September to February), so if there is a particular bird you would like to see it's best to find out in advance when the bird might be in the Bahamas. The islands are a popular roosting spot for many different birds, the most common on the islands being egrets, herons, Bahama pintails, ruddy ducks, and Caribbean coots, while birds journeying further north or south often alight on the islands for a short time.